Introducing Kong! 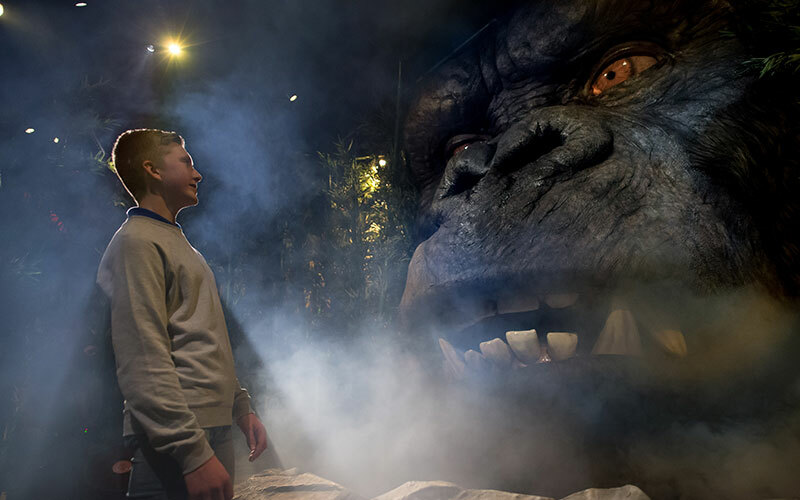 2 robotic lifesize King Kong heads on display at Madame Tussauds – London and New York. 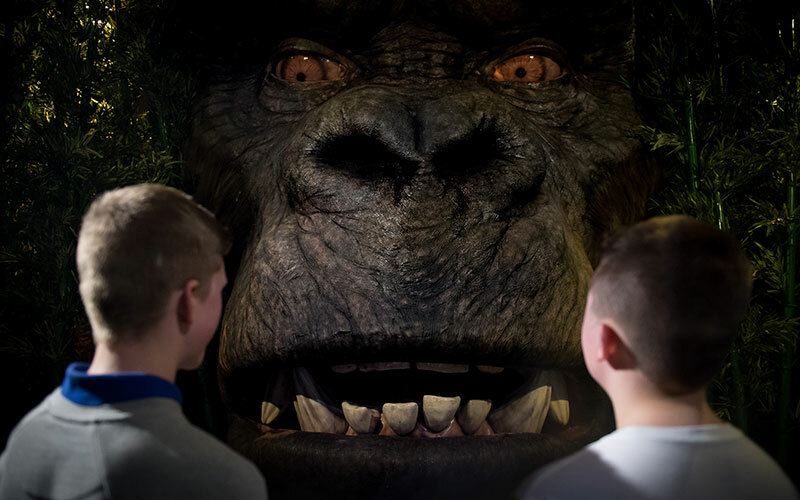 Built by Engineered Arts in collaboration with Madame Tussauds, Merlin Magic Making, Millenium FX, Legendary Pictures and Warner Bros. 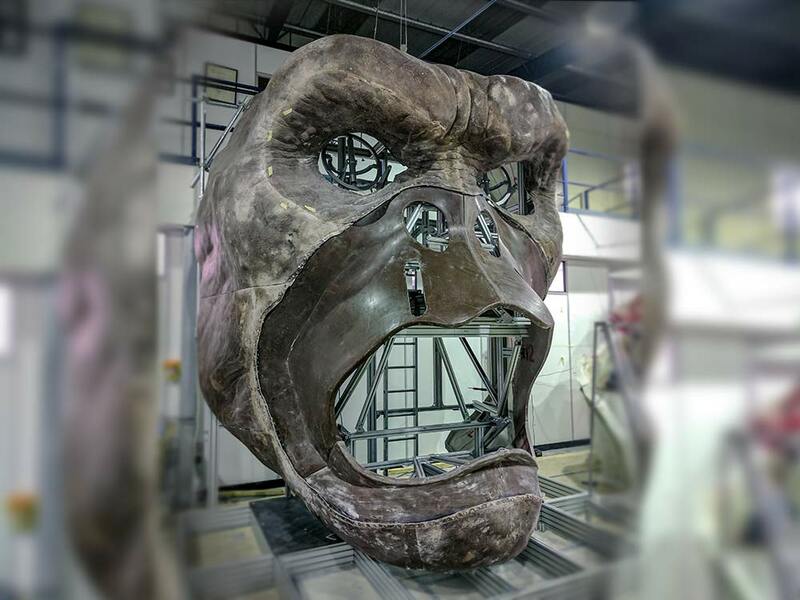 The heads are accurate to ‘Kong: Skull Island’ released in 2017 by Warner Bros and Legendary Pictures. 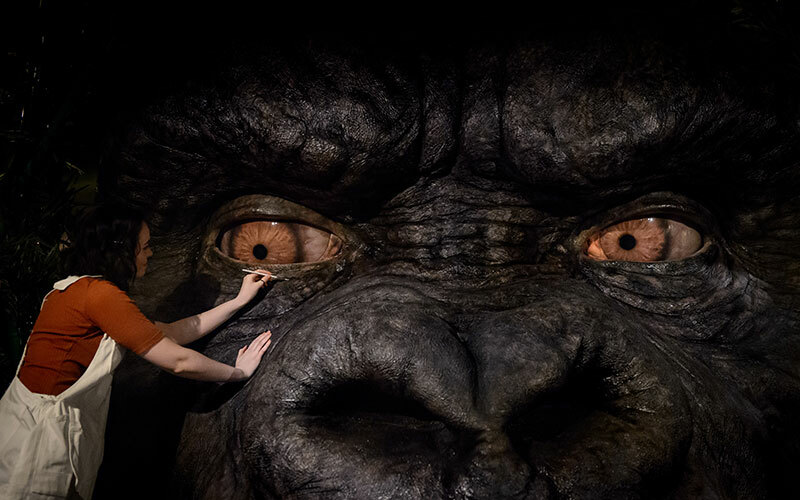 Kong is more than a simple animatronic, he is interactive. 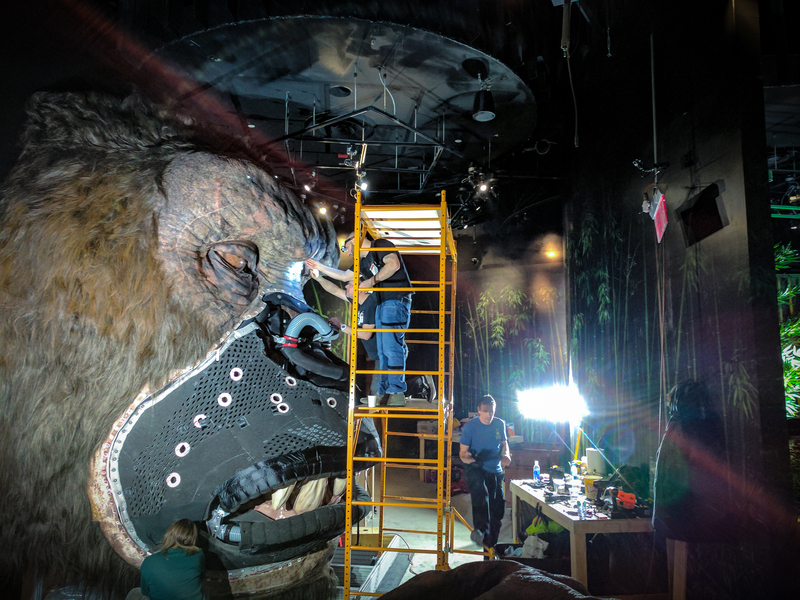 Using sensors and custom software, his eyes follow you around the room, he snarls, roars and blasts air from his nostrils at his unsuspecting public. 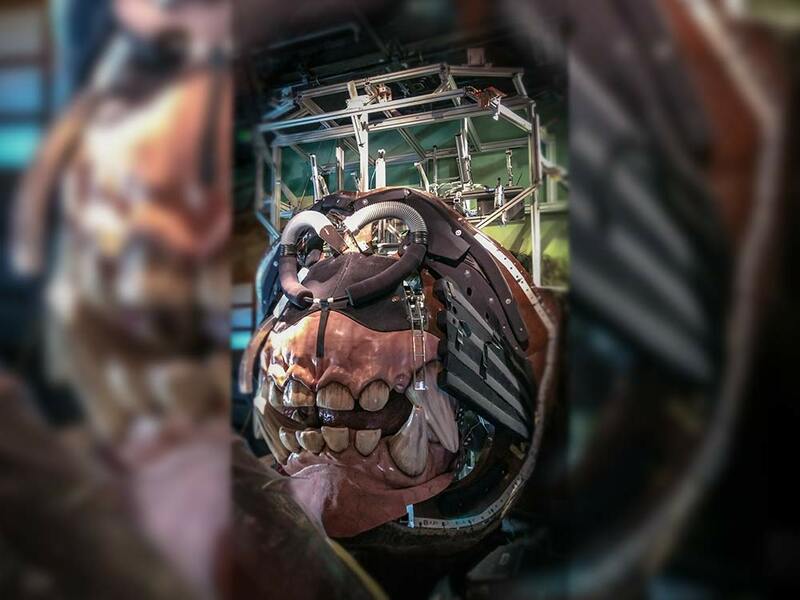 Engineered Arts were responsible for the design and build of the mechanical elements of the two Kongs, along with the operating software that makes it all work. 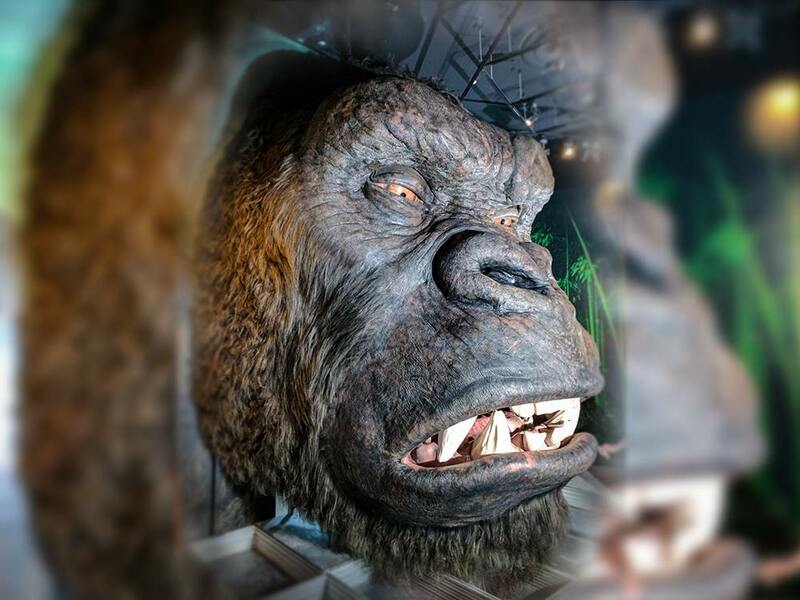 Once Legendary provided the virtual model of Kong, our team set about designing mechanical hardware that was both movie-accurate and robust enough to meet the high demands of daily operation in a public environment. Due to time and geographical constraints, the mechanical elements and outer skins were developed at the same time in completely different locations. 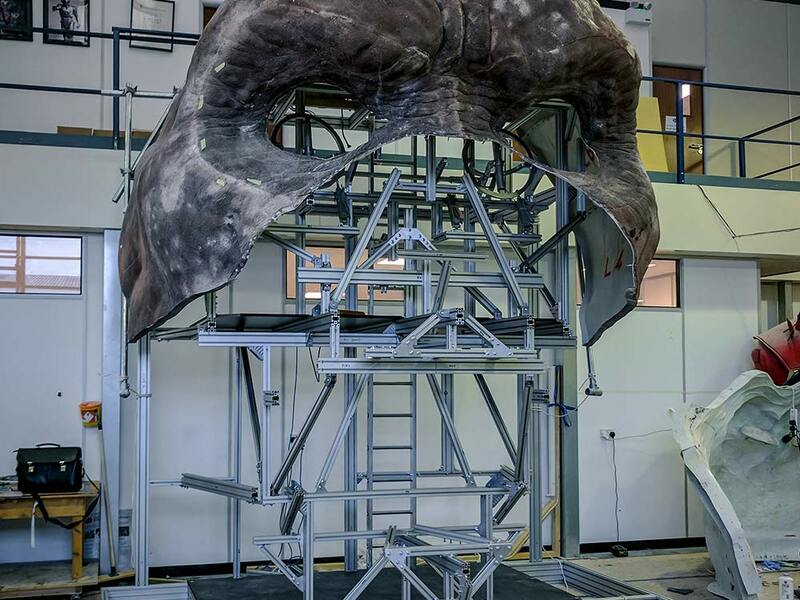 An accurate design and build process was crucial to ensuring seamless integration with the outer shell and skin produced by Millennium FX. We actuated the Kong head with pneumatics. This allows, smooth, fast and most importantly safe movement. Features already established in our “off the shelf” model RoboThespian. 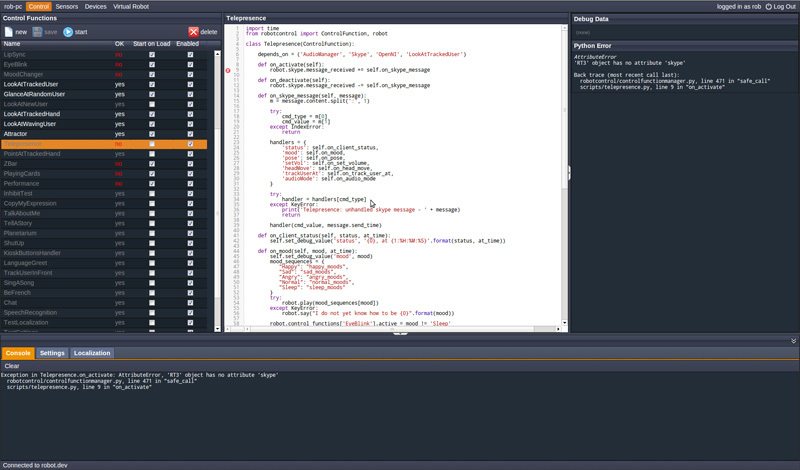 This allowed for an efficient and cost-effective development and testing cycle. 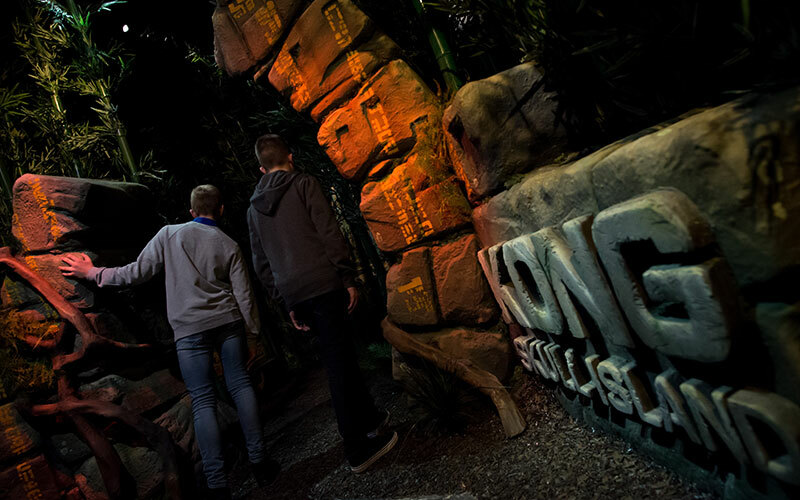 Kong features sensors and software that adjust his behaviour depending on various stimuli. 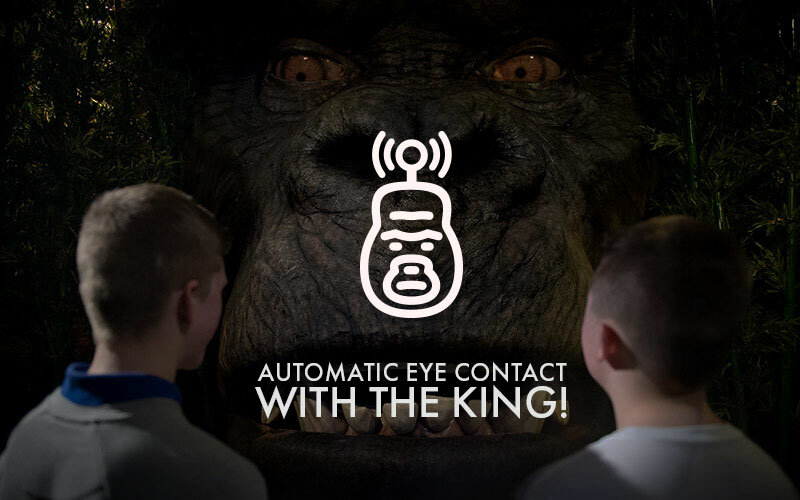 Kong uses Lidar technology to accurately track people in his vicinity. Software interprets this information and tells him to look at the tracked people. All of this happens in real time and seamlessly. If conditions are just right, he might just blast a whole tank of compressed air from his nostrils in visitors faces whilst he vocalises his anger. Virtual Robot offers a powerful way of programming content for an animatronic with an intuitive, multi-layered graphical user interface. Designed by Engineered Arts, this web-enabled software runs on HTML5 with WebGL, requires no installation, and is cross-system compatible. The character can be posed using the mouse, simply by clicking and dragging eyes, mouth, nostrils, sounds, …etc. 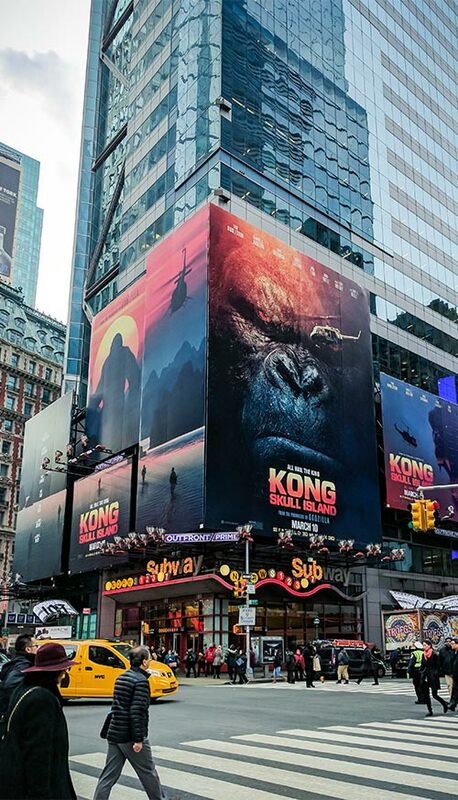 We animated the content for Kong, however, the software allows customers to add their own content wherever they are in the world. 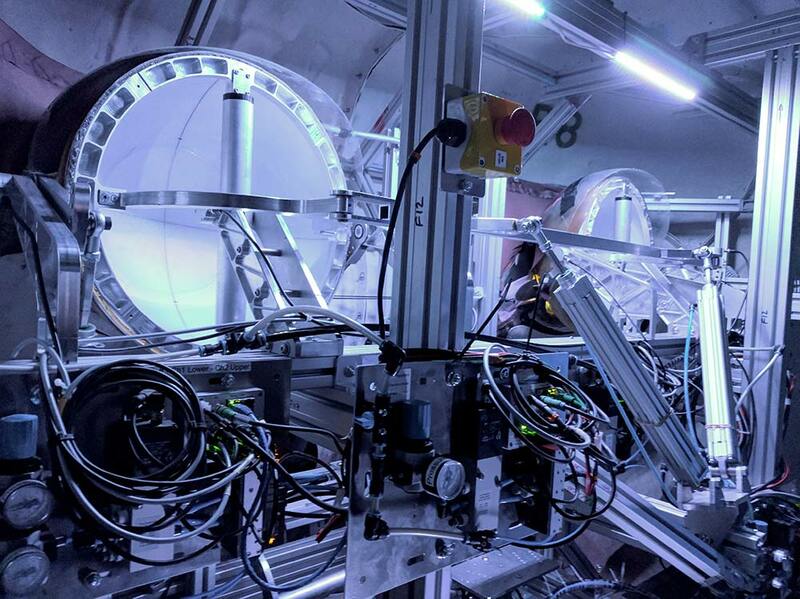 As soon as new content is created it can be transferred to one or all operated animatronics instantly. 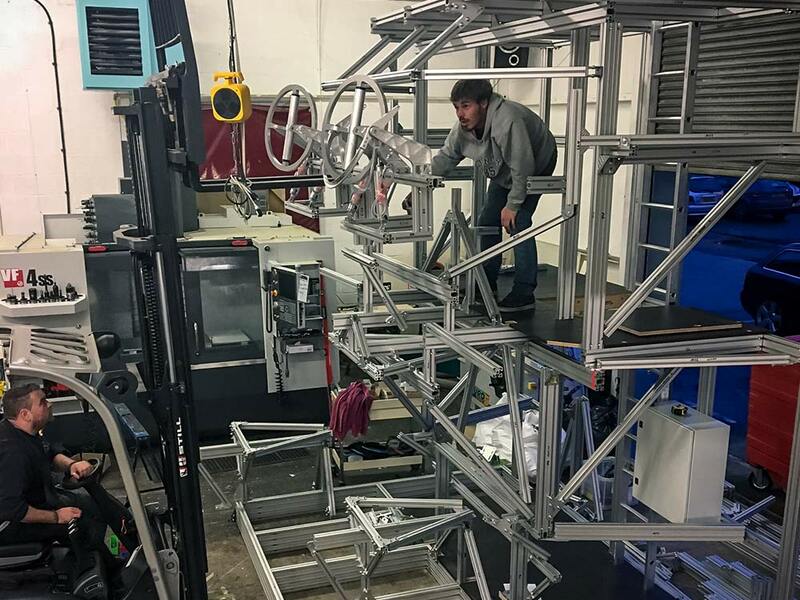 Installation and testing in New York, then London. A robot with natural intelligence. 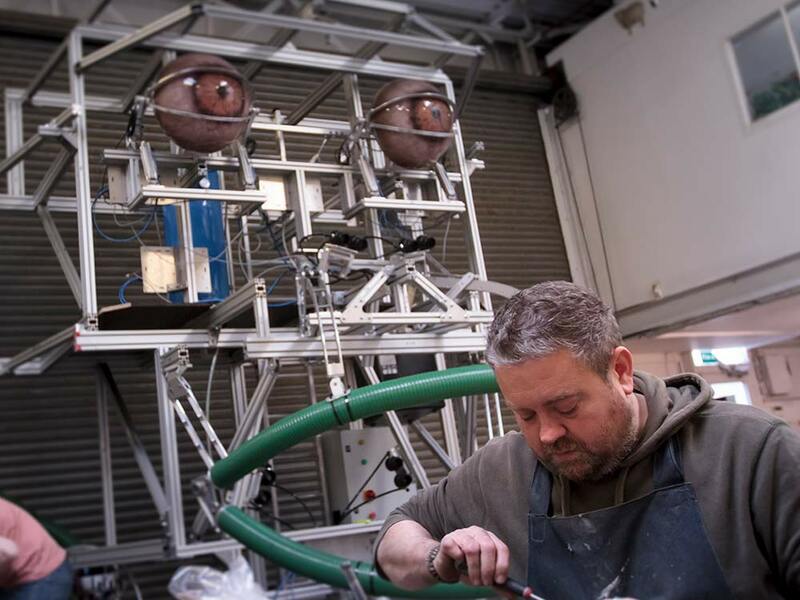 A robot that captivates and inspires wherever it goes. Introducing TinMan. Telepresence, by Engineered Arts. Now you can be the robot from anywhere in the world. TinMan hands you real-time control of any of our robots. Big or small. 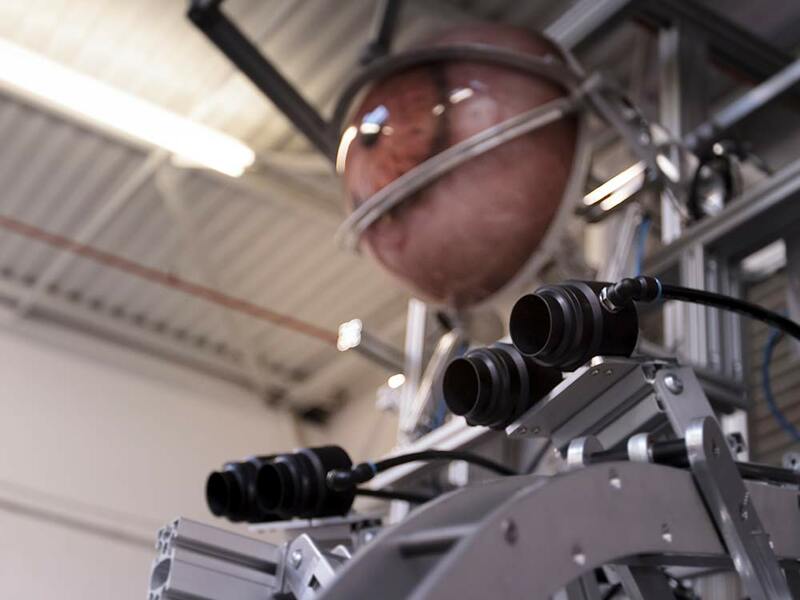 Although not utilised on this installation, using inbuilt cameras and microphones, it is possible to control the robot’s gaze, enter a natural conversation, and trigger content on the fly. Automated features like maintaining eye contact keep interaction compelling and believable. Allowing you to concentrate on the fun stuff. BLOWING PEOPLE’S MINDS! TinMan offers unrivalled levels of engagement and provides lasting positive memories about your business or attraction. Complex technology and clever design, disappear into simple intuitive use. Enabling truly breathtaking interaction, with no distractions. While instant visual feedback of the robot keeps you looking the part. This powerful software is packed into the simplicity of a browser. So no need to install anything. Designed from the ground up, TinMan works on desktop, tablet and even smartphone. So you can beam into any of your robots. Just log in and go. 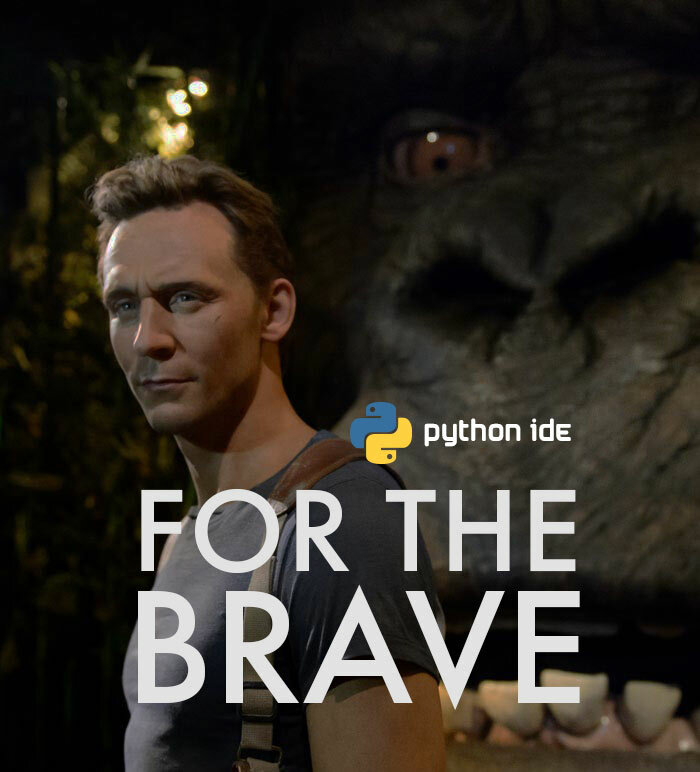 For users wishing to delve more deeply into the possibilities afforded by our animatronics, we provide an integrated developer environment where you can use Python to create your own control functions and subroutines for the robot. Use the figure’s many sensors to register data from the environment; control the hardware to make the robot truly responsive. Although the Kong is set up to run totally autonomously, he could just as easily be set up with a rugged, public-facing touchscreen kiosk. Using the same software as RoboThespian & SociBot people can select languages, trigger content, animate the robot and see what its sensors see. 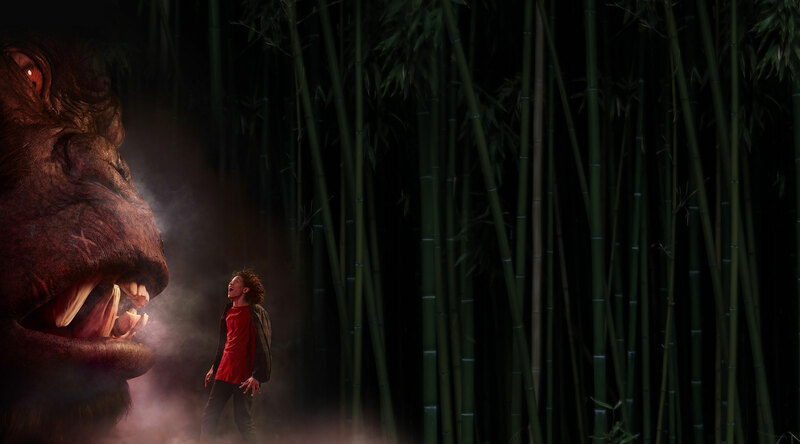 Our interface allows people of all ages and backgrounds to actively control our characters. If ordered, the kiosk arrives ready to go with your pre-programmed content & languages already set up. Just plug in and go. Administrators can use our web-based software to manage and customise what the public can see and do on the kiosk. Even upload graphics to the kiosk for a truly personalised interface.